heat coconut cream until liquid and mix in vanilla. place chocolate a bowl with your flavouring of choice (if doubling use 2 bowls, if not and you want 2 kinds then just halve the flavouring amount and place in separate bowls with half the chocolate in each). quickly whisk in the warm coconut cream until the chocolate is smooth and creamy. cover and refrigerate until set (you can do this waaay ahead of time and keep it in the fridge). 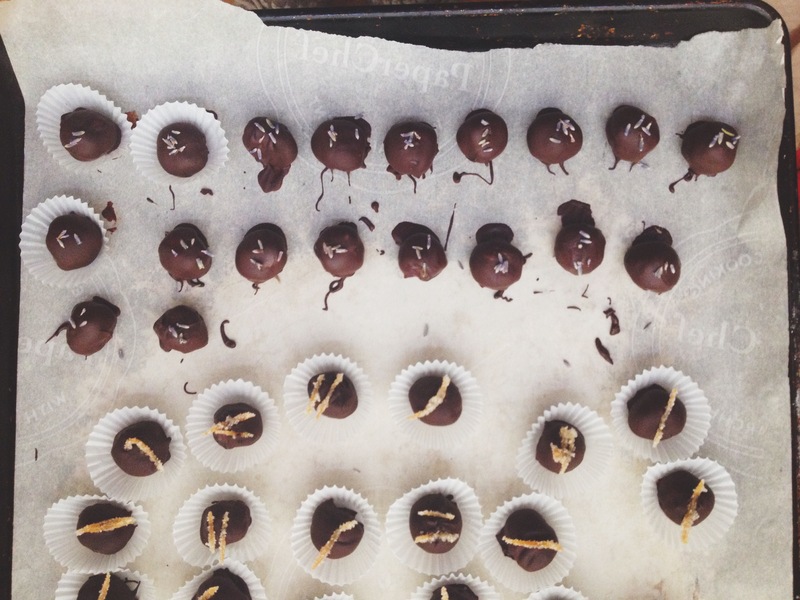 roll out your ganache into walnut sized balls (i did 7 grams each if you feel like weighing). if they get melty just take a break and wash your hands in cold water. i could go into tempering and not tempering but the truth of the matter is that my candy thermometer is broken and i’m just not that fussy. so i melt the chocolate in a large bowl over not quite boiling water until it’s nice and silky. remove the bowl, wipe any dampness off the outside and then (if you have it) place on a heating pad set on low. this was a breakthrough moment for me in my chocolate dipping, it will make your life so much easier. if you don’t have one you’ll occasionally need to flash the bowl into the hot water again to loosen it up. make sure no water ever gets in your chocolate, as it will seize up and become undippable garbage. dip each ball into the chocolate (i lower it with a fork) then tap off the excess a few times. gently lay out parchment and add your garnish. once they’re set gently break off any little feet that may have formed. if you didn’t temper them it’s best to keep them in the fridge. they will be fine if they sit out but longterm they’re better in the fridge and the chocolate will have a nicer shell. remove peel with as little pith attached as possible. place peels in a pot with cold water to cover, bring to a boil, drain, recover and do this again 2 more times. cut peel into fine strips. depending on how much peel you have, place in a small saucepan with enough cold water to cover by 1/2 inch and then add double the amount of water in sugar. bring to a boil then simmer for 15-20 minutes until the peels are translucent, drain and toss in sugar. spread out on parchment to dry.